Chainsaws are incredibly handy power﻿ tools. There are so many uses for them around your home if you live in a wooded area. They make thinning out overpopulated sections of trees, cutting up large fallen branches and preparing firewood extremely easy. As useful as they are they also are a tool that takes much abuse as you use it. Among the items you will have to replace most often on a chainsaw is the cutting chain itself. That is why we are here to help show you how to choose one of the best chainsaw chains that you can buy. One of the things we hope to establish with this article is to alert you to the fact that you don’t just want to go out and buy any old brand of chainsaw replacement chain. That is because if you do and it’s a bad choice then you will just have to replace that chain again in a short period of time. You must get the right size replacement chain for your chainsaw. If you buy the wrong size you will never get it to fit or it will be way to loose. Once you open the replacement chain package you will probably not be able to return it either so it’s important to get this step right. Your chain size will be stated right in your owner’s manual but if you don’t have it handy then it’s easy enough to measure on your chainsaw. You simply measure from where the chain first comes out of the housing to the very tip of it. In many cases with products OEM replacement parts are usually better than parts made by outside companies. You will see from our review list of the best chainsaw chains that is not always the case here. Even though any chainsaw replacement chain that is made by the manufacturer of your particular chainsaw is always a good choice, make sure you also consider some of the other fine replacement chains that may be cheaper and work just as well too. 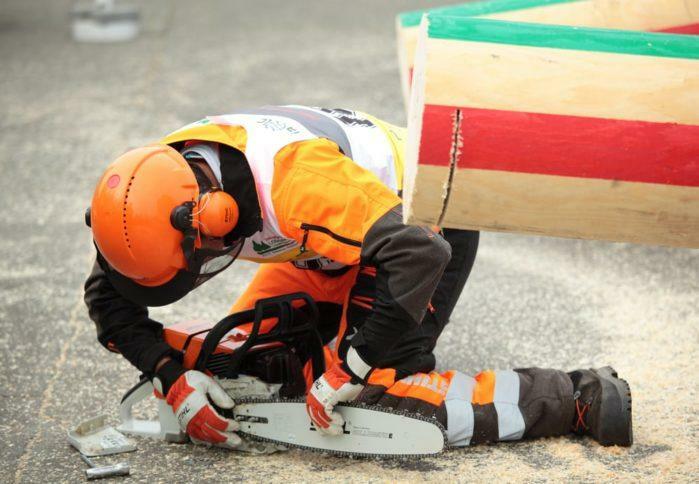 Excessive amounts of vibration can make using your chainsaw much more tedious than it needs to be. It’s a natural part of using a chainsaw but it can be minimized as far as cutting vibration goes (there is nothing you can do about engine vibration). Some chainsaw chains have special features built into them that cause them to vibrate less than normal chains. This is definitely something to look for on the package when purchasing a replacement chain for your chainsaw. We just talked about vibration and we will also talk about poor chainsaw chain tension too. These occur naturally from time to time as you use your chainsaw but a chain that fits over the guide properly can help minimize these greatly. You fit your replacement chain properly by getting one with the exact right ‘pitch and gauge’ for your particular model chainsaw. These dimensions can be found in your owners-manual or online at your chainsaw manufacturer’s website. 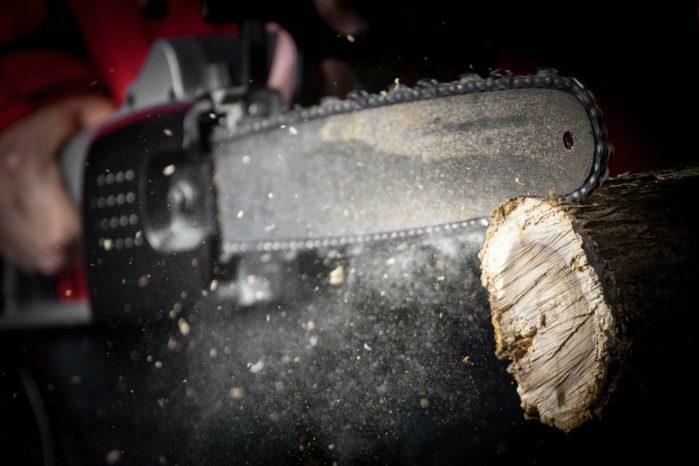 It’s no secret that chainsaws can be very dangerous to operate. One of the biggest concerns when operating one is what is known as kickback. Kickback occurs when the chain catches or gets pinched in an area of wood. There are chains that are designed to help minimize this from happening but they also tend to slow down the cutting process. These types of chains are worth considering if you are a novice chainsaw user. If this is your first time replacing your chainsaw chain don’t worry and don’t be intimidated. It really is a very simple process once you get used to it. Most long time chainsaw users carry extra chains and have learned to change them in less than 5 minutes. Here are the basic steps involved in replacing a chainsaw chain. Remove what is known as the guide bar side panel that covers the end of the chain near the motor. If your chain break is attached here too make sure it is in the unlocked position before removing the cover. Release the tension on the chain by backing off the chain tension screw. Once the chain tension has been taken off you should be able to easily take the old chain off. Gently clean off any residue or corrosion on the chainsaw guide bar with a cloth or by using a Teflon pan cleaning pad. Put on the new chain. It is ultra-important that the chain be facing the right way or it will not cut and you will have to do these steps all over. It is easy to get this wrong if you are not paying attention. The saw chain will rotate clockwise and cut when it is coming back toward you so the teeth must be facing you on the bottom side of the guide. Here is a very good replacement chain for many 14 inch chainsaw brands. This will help your smaller sized chainsaw perform like a much bigger one. It cuts smooth and does so in a way that keeps the chips from clogging the chain and also helps prevent dangerous kickbacks too. Make sure you wear a pair of googles when using a chainsaw with this blade on it (it is always recommended to wear safety goggles when using a chainsaw anyway) because it has a very impressive chip flow to it. The manufacturer says it uses a unique cut design technology and it sure seems that is true. This is a replacement chainsaw chain that should last you a long time if you use it properly too. It is made of hardened steel and that makes it stronger so it stays﻿ sharper longer. This chain also has a high amount of chrome in it too which makes it very corrosion resistant. Husqvarna proves with this product that they are not just good at making chainsaws but they are good at making replacement chains for them too. This replacement chain fits not only Husqvarna model products but many other brands too. It is an excellent choice for small to medium sized jobs that require a lot of cuts to be made. Once you are cutting with it you will be pleasantly surprised how much smoother your chainsaw feels. This replacement chain tends to cut down on vibration and it also helps keep your chain from causing kickbacks. Most people that use it are very pleased with this chains performance. This is a chain that will work well for both the casual homeowner who cuts a few trees and for a professional arborist. It will stay sharp for a very long time too if you keep the chain oiled and keep it off the ground. The price is very reasonable on this item and Husqvarna is a company that is known for standing behind what they sell. This an excellent OEM replacement chain for most Poulan 14 inch chainsaws. It stays sharp for a long time and really does a nice job cutting through most wood types. It also fits perfectly on most 14” Poulan chainsaws and a select few other brands too. One nice thing about this replacement chain is its very affordable price for how well it works. That is rare for what is considered an OEM part. This rugged chainsaw replacement chain not only cuts well but it also helps reduce the risk of kickbacks too. One of the nice thing about Poulan is they make it easy to match up their replacement chains to their chainsaws. They do this by using a special color match system. This is very important because this Poulan chain does not fir on as many other brands as some of the other replacement chains we reviewed. Stihl is known for making some of the best electric chainsaws but this product proves they are no slouch at making very good chainsaw replacement chains also. This is a high quality replacement chain to say the least. It goes through most wood easily and has a chip flow that nicely keeps the chain clean while doing it. This is also a chain that features a very low kickback rate that helps make your chainsaw safer to use. Part of this is due to the fact that this chain is designed to stay better lubricated than most other replacement chains. It is a very durable chainsaw chain too. This chain features chrome coated teeth so they stay sharper longer and it also comes pre-stretched so the tension on it does not constantly have to be adjusted like some other chainsaw chains do. We mentioned that in the world of chainsaw replacement chains going with OEM parts is not always the best way to go. The﻿ ﻿﻿﻿Oregon﻿﻿ 14-Inch Chain Saw replacement cha﻿i﻿n is proof of this. We feel it is the best replacement chain we reviewed and that is saying something since they are all high quality chainsaw replacement chains. It cuts through wood easily and does it in a smooth and safe way. If you pick one of these up for a spare, your chainsaws performance will get even better once you put this high quality replacement chain on it. Polyurethane vs. Polyacrylic: Which is the Best for Your Next Project?